Exhibition opening: Sunday, July 12 at 12:00 p.m. Followed by a tour of the exhibition with Antje Majewski. Antje Majewski and Paweł Freisler featuring Agnieszka Polska, Jimmie Durham and Piotr Życieński. In cooperation with Fundacja Transformacja (Łódź), Eckart Brandt (Boomgarden-Projekt) and in Mönchengladbach Transition Town Initiative, Berg Garten Oase, Margarethengarten, JUKOMM im STEP, Volkshochschule Mönchengladbach, Stiftisches Humanistisches Gymnasium, Mönchengladbach Urban Planning and Parks Department, NABU NRW, and Baumschule Morjan. Initiated by artists Antje Majewski and Paweł Freisler this exhibition about the apple is an at once artistic and scientific-cultural historical project that expands into public space with a planting intervention involving various groups and initiatives throughout the city. Both Paweł Freisler’s dried and carved apples and Antje Majewski’s paintings of apple varieties show the apple as an object of meditation, evoking reflection on nature and time. As natural and artificial clones, both the apples themselves and their high tech replicas conjure a surprising parallel between nature and technology. In her film The Freedom of Apples, Majewski conducts a fascinating case study on biodiversity, calling to mind the complex relationships between the global food industry and technological progress. 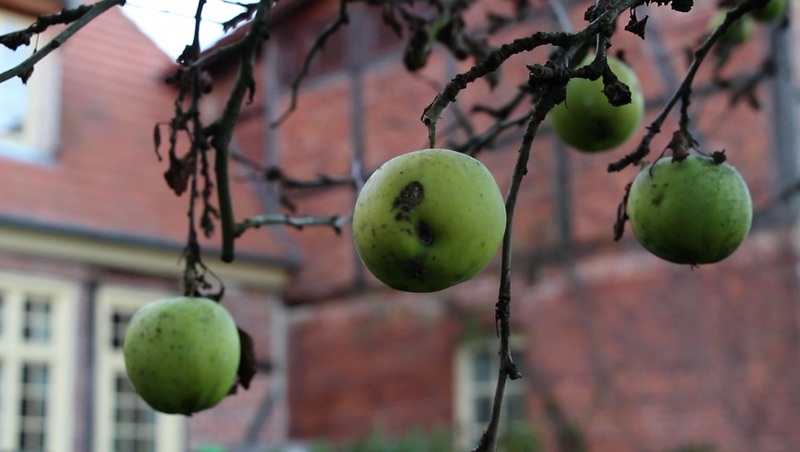 Agnieszka Polska’s video leads us into Freisler’s legendary garden, while Jimmie Durham’s apple juice bottles were produced for dOCUMENTA(13), in a project that also involved the planting of two apple trees. For the first time, the exhibition will expand into an artistic-ecological project for the city as part of the outdoor project AN INNOCENT DREAM OF A PARK. In late October, one hundred trees of old, Lower Rhine region apple varieties will be planted in public spaces around the city. Their apples will be open to all Mönchengladbach residents. If you are interested in becoming a tree sponsor, please call 02161-252631. While trees are being handed over to sponsors, Fundacja Transformacja will be conducting workshops with practical knowledge about the plants and tree care. Museum neighbors including the city’s community college (Volkshochschule), high school Stiftische Humanistische Gymnasium and the JUKOMM im STEP Youth Center on Hans Jonas-Park are also participating, joined by activists from the local garden initiatives Berg-Garten Oase, Transition Town Initiative, and the Waldhaus 12 e.V. “Margarethengarten”. On September 19, we will be celebrating an apple festival together in Hans-Jonas-Park, reviving the tradition of a town Apfelfest. Eckart Brandt will be introducing apples from his “Boomgarden-Projekt”. This exhibition was realized by Museum Abteiberg in cooperation with Muzeum Sztuki, Łódź and funded with support from the North Rhine-Westphalia Ministry for Families, Children, Youth, Culture, and Sport; Hans Fries Foundation; Stadtsparkasse Mönchengladbach; NABU Nordrhein-Westfalen; Baumschule Morjan treenursery, Erkelenz; the printer company Zortrax; Süchtelner Apfelhof apple farm with its “Apfelgold,” and other business and private sponsors. The exhibition is accompanied by a catalogue published by Sternberg Press. Edited by Aleksandra Jach, Antje Majewski, Joanna Sokołowska, and Susanne Titz, the publication features contributions by Jimmie Durham, Anders Ettinger, Paweł Freisler, Fundacja Transformacja, J.K. Gibson-Graham and Ethan Miller, Antje Majewski, Agnieszka Polska, Joanna Sokołowska, and Susanne Titz. Anticipated release date: August 2015.